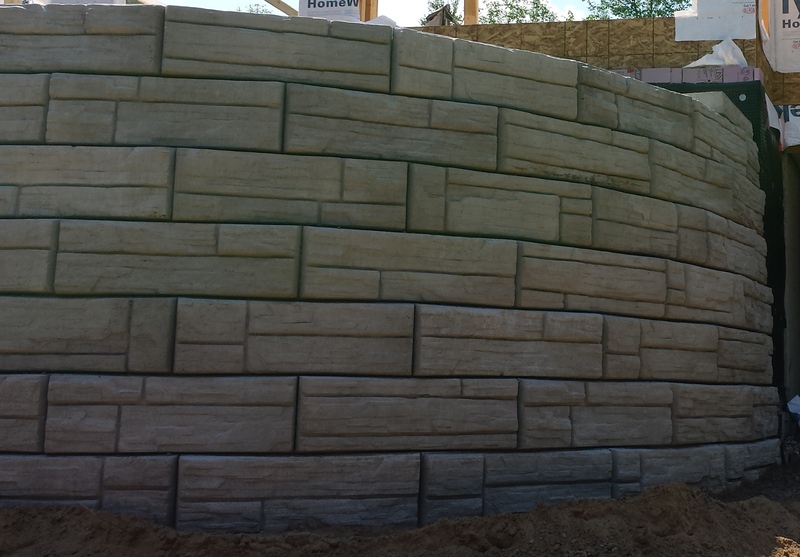 Boyd Bros Concrete proudly manufactures retaining wall blocks for ReCon Retaining Walls. 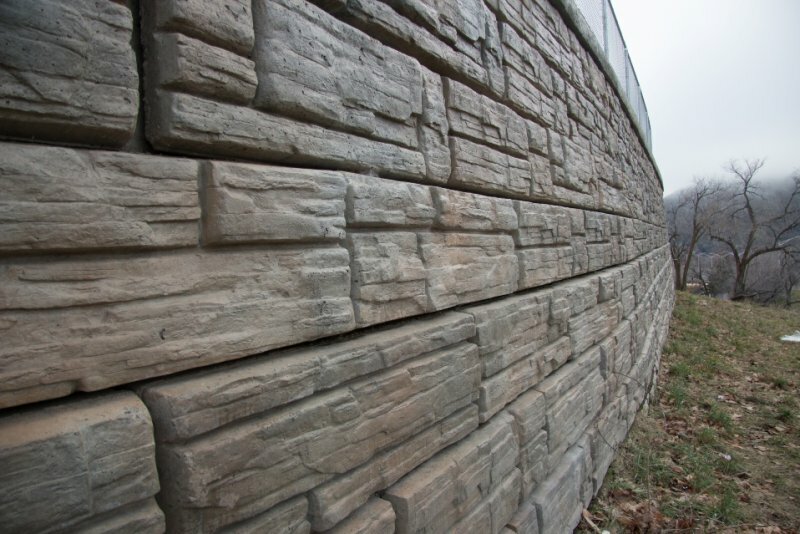 ReCon Walls are high-quality concrete wall systems with a decorative ‘weathered-edge’ stone-like finish. Available in natural grey this system will not only look great, but will satisfy any site condition, as they can be fully engineered if needed. 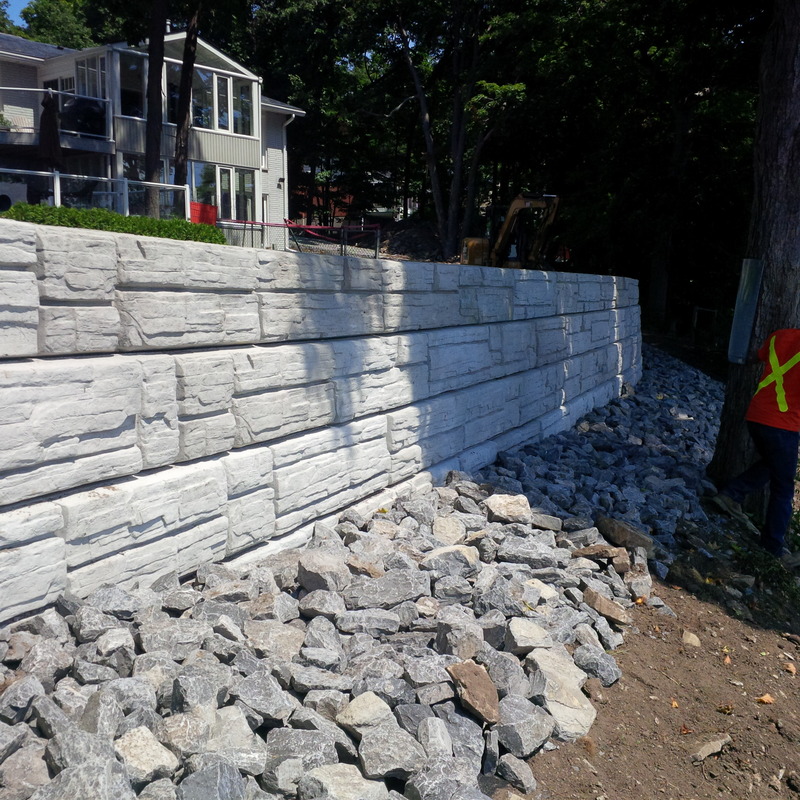 Their varied-depth approach to the blocks allows for gravity retaining walls to reach as high as 20’ without any type of geogrid reinforcement. Need something higher? Add a hybrid design with geogrid. Send us your plans or call us with your wall requirements – AND – While we don’t do any onsite work, we will happily recommend a local contractor to work with you! Visit our Downloads page for all block specs. Most notable is the unique tongue-and-groove, lock-in-place design. As a result of combining this unique design with massive size and weight, you get wall heights that can reach up to 20+ ft (6m) without reinforcing geogrid. Do away with the time and cost associated with excavation and back-filling by applying geogrid reinforcement, when needed. 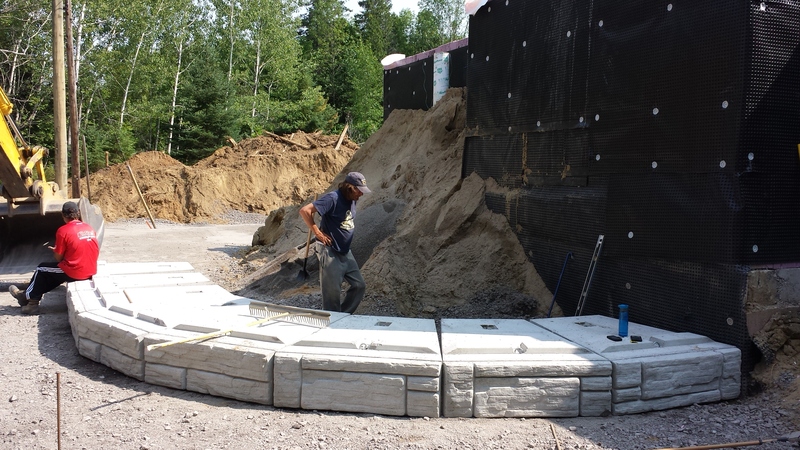 Blocks are made of wet-cast, air-entrained concrete with a minimum psi of 4,000 (28 MPa). This means they have the durability required for environments prone to the challenges of freeze/thaw cycles, road salts and of course, brackish water. Maximize productivity and minimize labor. Use backhoes and skid steers, already available to you, to install quickly and easily. No mortar, therefore no pins. 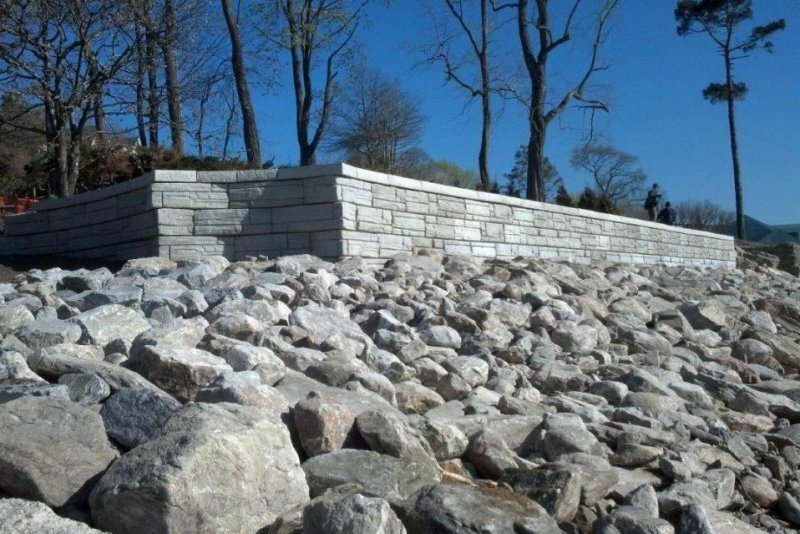 ReCon Walls are professionally engineered and designed using shear and geogrid connection data which is unique to the ReCon platform. 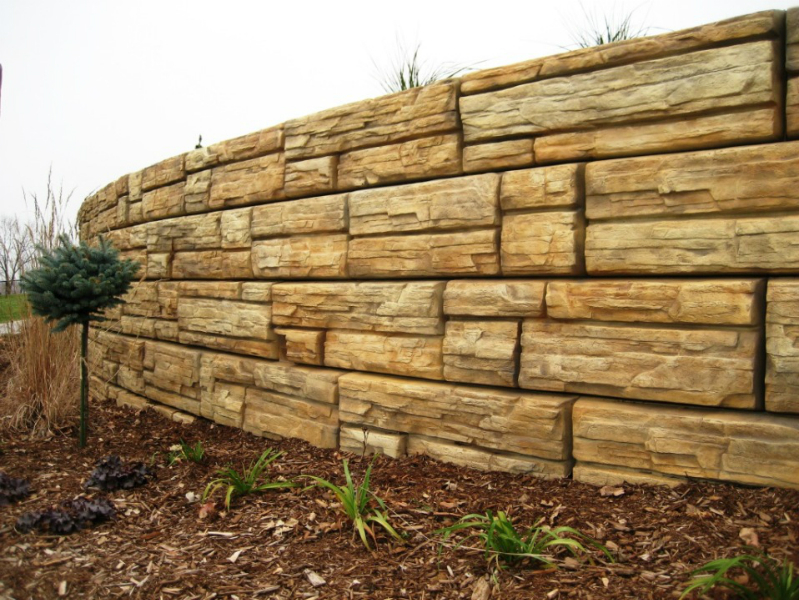 The natural stone finish has several different textured patterns, which prevent repetition in the overall wall pattern. Also, you can achieve a more natural look by easily applying a stain, in the field, after install. Blocks come in multiple depths that optimize design efficiency by providing the mass when its required or eliminating it when its not, therefore saving you money on material and freight. Tapered block design allows both inside and outside 90-degree corners or curves. 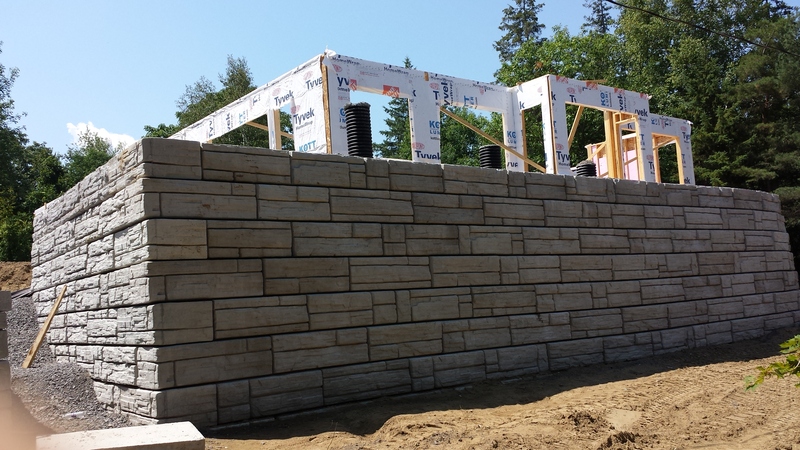 Cap blocks are available for finishing options, as well as special top blocks which allow green space to come within four inches of the front of the finished wall.